ALD-52 is the chemical abbreviation for the lesser known name 1-acetyl-LSD and is an analog to the popular designer drug acid. (commonly known as LSD or lysergic acid diethylamide) The research chemical ALD-52 is known to undergo a process called hydrolysis which in turn forms it's lysergamide relative LSD. Due to these qualities, the legality of ALD-52 is questionable if it begins this process and proceeds to break down into its counterpart. As with all of these novel compounds, research laboratories buy these research chemicals online (like LSZ and AL-LAD) so that they may study the chemicals behavior in various conditions. And so, if you choose to buy ALD-52 online through a research chemical vendor (such as Causing Color) then you must be aware of the legality of said compound within your country to avoid any legal trouble. 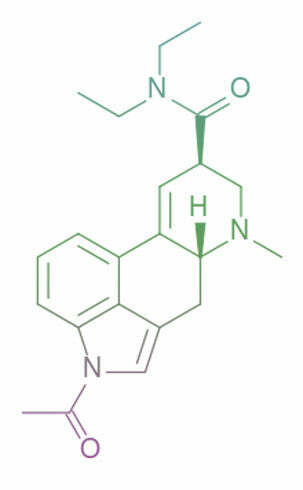 This chemical is currently considered illegal in Latvia, although not officially scheduled, is considered a structural analog of LSD due to an amendment made on June 1st, 2015. Now, this lysergamide is not for human consumption under any circumstance. If you accidently ingest it then it would be wise to call a poison control center immediately. Due to its potency in the microgram range, one should wear gloves when handling it. Came within a month and was very high quality. I will order from them again! Product came as expected and their customer support is phenomenal. As for the ALD-52: Was a wonderful experience. 1P-LSD had better visuals for me but the ALD-52 gave me a better “feel good” sensation. I got my order about 19 days after making my payment. Which was fine with me. I was so excited to find it in my mailbox! But I was equally disappointed with the results. Trust me, ALD-52, if that's what I got, does NOT turn into LSD-25 through hydrolysis. I received my order all in one piece, and customer service was great. then you are golden. Awesome site non the less.